Newly renovated and expanded Vol Walker Hall. FAYETTEVILLE, Ark. – A record number of students will start classes at the University of Arkansas this week – more than 25,000 undergraduate and graduate students, the first time the university has broken this landmark number. This continues the steady trend of the past five years that led the Chronicle of Higher Education to rank the U of A in the top 15 fastest growing public research institutions in the country. Returning students will find a campus they barely recognize, but somehow remember. The major construction projects that started in 2011 are finished, and the central core of the campus looks much as it did three years ago, only better. Let’s start with Vol Walker Hall. 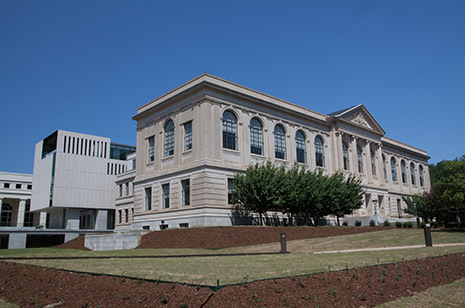 The renovation and expansion of this historic building is finished, and it now includes the addition of the Steven L. Anderson Design Center. For the first time students and faculty for all three departments — architecture, landscape architecture and interior design — in the Fay Jones School of Architecture will be in one building, with classrooms specifically designed to provide the workspace the school’s students need. The renovation also includes an environmentally friendly and picturesque “living” roof. Then there’s Ozark Hall, the second major renovation and expansion project, which has completely modernized the interior of this historic building, while adding 17,000 square feet of new classrooms and office space. Ozark Hall is the new home for the Honors College and the Graduate School and International Studies, and it also provides renovated, modern offices and classrooms for the geosciences department. Returning students will be amazed to see that the fences that surrounded these two buildings — blocking sidewalks and making it tricky to get around campus — are gone. In place of the noise and apparent chaos of the construction sites are beautifully landscaped grounds, unobstructed paths, and relative peace and quiet. At least until students start changing classes. Which brings up something else that is new: starting this semester there are now 15 minutes between classes. It’s a change student leaders asked for and one that recognizes that the campus has grown and students need more time to get from one building to another. For the most part class time hasn’t changed – except for Tuesday and Thursday classes, which are now 75 minutes long instead of 80 minutes. Two other construction projects are also finished – and they mean that another 600 students are now able to live in residence halls on campus. The renovation of Hotz Hall transformed the building back into a residence hall, the new Hotz Honors Hall, which can house 416 in-coming freshmen honors students. Founders Hall, the newest building on campus, is a residence hall that will house 214 students. The construction included remodeling and expanding Brough Commons Dining Hall as well – it has close to 400 more seats combined on the first and second floors, not to mention room for more retail businesses on the street level. The main evidence of major construction that remains in the campus core is the temporary access road built from Dickson Street across the Old Main Lawn. This was used by heavy trucks hauling equipment and building materials to the Vol Walker Hall and Ozark Hall sites. That road is currently being removed and the lawn will be restored – as will sections of Senior Walk, and the wall that was removed along Dickson Street. For students who ride scooters around campus — and there are more of them than ever — a new scooter parking area will accommodate 75 to 100 scooters. It’s in lot 38 at the corner of Leverett Avenue and Maple Street. Last but not least, you’ve probably heard that the Razorback football team has a new head coach, Bret Bielema. He will lead the team in its first home game Aug. 31. The Razorback football student-athletes and staff have a new home base as well — the Fred W. Smith Football Center, located on the south end of Donald W. Reynolds Razorback Stadium.